Pusey’s contracts with drug-benefit managers at his Medicap Pharmacy in Olyphant, Pennsylvania, bar him from volunteering the fact that for many cheap, generic medicines, co-pays sometimes are more expensive than if patients simply pay out of pocket and bypass insurance. The extra money — what the industry calls a clawback — ends up with the benefit companies. Pusey tells customers only if they ask. The clawbacks work like this: A patient goes to a pharmacy and pays a co-pay amount — perhaps $10 — agreed to by the pharmacy benefits manager, or PBM, and the insurers who hire it. 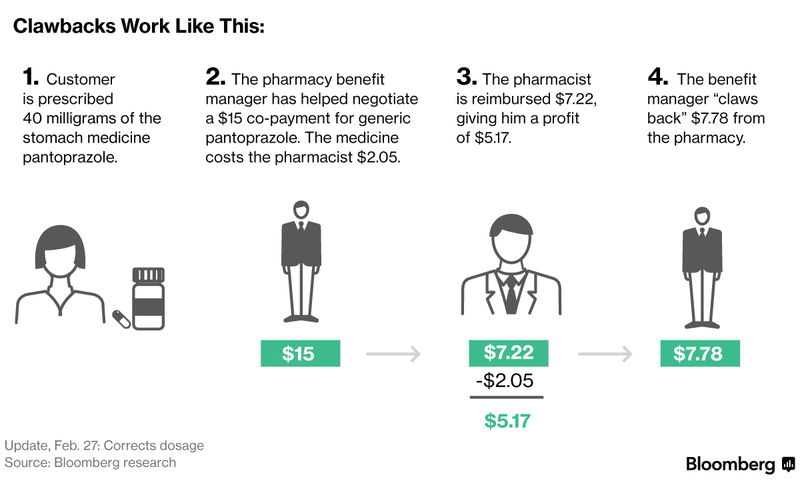 The pharmacist gets reimbursed for the price of the drug, say $2, and possibly a small profit. Then the benefits manager “claws back” the remainder. Most patients never realize there’s a cheaper cash price. Pharmacies fear getting removed from reimbursement networks, a potential death blow in smaller communities. But some pharmacists jump at opportunities to inform customers who question their co-pay amounts.